In Jim Clark's first Grand Prix race, the 1960 Dutch Grand Prix at Zandvoort, he battled in his Lotus 18 with Graham Hill's BRM P48, the first of many such races with Hill, who, like Gurney, would ultimately become a teammate of Clark's later on in the 1960's. Clark was holding his own against the more experienced Hill - swapping places at the Tarzan corner and on the main straight - until Clark's gearbox gave up. This was the same race that Gurney's BRM ran out of brakes and overturned, killing a spectator. The carnage that was all too commonplace in Clark's era continued at the next race, the 1960 Belgian Grand Prix at Spa, this time with Clark as a close observer. Although Clark finished in 5th, the race was a disaster for others. On lap 20, fellow Brit Chris Bristow crashed his Cooper approaching Burnenville, was thrown from his car and died instantly. Clark, who had qualified right behind Bristow, was the first car through and had no warning of the accident awaiting him around the next curve. Clark remembered the shock of seeing the accident: "I came bustling down and no one had any flags out to warn me of what was round the corner. I saw a marshal suddenly dash out on to the road, waving his arms and trying to stop me, and the next thing I saw was another marshal run from the far side of the road. I remember thinking 'Where is he going?' and then he bent down and grabbed the thing by the side of the road. It looked just like a rag doll. It was horrible and I'll never forget the sight of his mangled body being dragged to the side." Five laps after this fatal accident, Alan Stacey, also in a Lotus, crashed and was killed, reportedly after being hit in the face by a pheasant. Another driver, Mike Taylor, running a privateer Lotus 18, was also seriously injured during a practice session for this race, after a suspension weld had broken. Finally, Stirling Moss, in yet another Lotus 18, had a half shaft let go in practice at Burnenville at 130 miles per hour and struck an earthen bank, passing out but surviving. With this kind of introduction, it is understandable that Clark developed an early distaste for the dangerous Spa. And it is a wonder that he ever stepped back into a Lotus after that weekend! The 1960 Portugese Grand Prix at Oporto was another noteworthy race in Clark's debut year in Grand Prix racing, as it summed up the conditions under which he drove. The Oporto circuit featured cobblestones, tramlines and hay bales and during practice Clark managed to get it all wrong on one of these terrain features, narrowly missing hitting a lamppost but thoroughly mangling the front end of the Lotus 18. "We went off to a workshop somewhere at around two in the morning, typical workshop, one 40-Watt bulb, but it did have an hydraulic press and on that we managed to straighten out the rack - bit of an eyeball job on that. We said: 'Yes, that looks straight.' The left-hand rear wishbone rear attachment - a strut it attached to - had broken out and [Chapman] said: 'We can weld that back.' I said: 'Well, ho hum.' We had real old-fashioned welding stuff, a pot of something to which you added water and stirred and it gave off acetylene - it went back to the dark days of gas lamps on cars. It was the most fantastical welding kit I've ever come across and I'm not a welder, really. Colin certainly wasn't. We got the car on the grid and Colin said to me: 'D'you think it'll be all right?' I said: 'Well, ho hum, yes.' He said: 'I think I ought to tell Jimmy.' So he trundled off and he had a word with Jimmy, came back and said: 'I've told him to keep out of trouble, not to get too close to anybody else in case it, you know, falls apart." As it happened, Clark, showing his incredible mechanical sympathy, nursed the infirm Lotus 18 through the race and finished third behind the Coopers of Jack Brabham and Bruce McLaren, Clark's first trip to the podium. Gurney, who otherwise had an abysmal season in the BRM, led the first 10 laps of this Oporto race from the front row before spinning in his own oil and ultimately going out with engine troubles. The last race of the 1960 season was the second running of the US Grand Prix, this time in Dan Gurney's hometown, Riverside, California. It was the first of many visits Clark would be making to America in the 1960s. For this special occasion, Gurney wrestled the BRM to third place on the grid (Clark was fifth), but both had problems in the race, with Gurney going out due to overheating and Clark finishing, uncharacteristically, dead last in 16th place. Happily, Jimmy would have better days ahead in the United States. Indeed, one significant event surrounding this 1960 US Grand Prix that would end up throwing Clark and Gurney together forever in the history books was that Jack Brabham, acting on suggestions made to him by 1959 Indy 500 winner Rodger Ward, took the Grand Prix T53 Cooper to Indianapolis for an exploratory run on October 5th 1960, en route to the Riverside Grand Prix in November. In that test run, the Cooper ran 144.8 mph, which was only two miles per hour slower than the fastest lap turned in at the 1960 Indy 500. Lotus, Clark and Gurney were to end up finishing the rear-engined revolution at Indy in the mid-sixties that began with Brabham and the shakedown run of the Cooper in October 1960. In Clark's second season, 1961, Ferrari held sway over the British teams as the team best prepared for the new 1.5 litre formula. Ferrari ran a powerhouse team that season, often fielding as many as four rear-engined sharknosed Type 156 Ferraris for certain races - and even five at Monza! - driven by a core group of Phil Hill, Wolfgang von Trips and Richie Ginther, with Giancarlo Baghetti, Olivier Gendebien and Ricardo Rodriquez rounding out the team during several significant races. 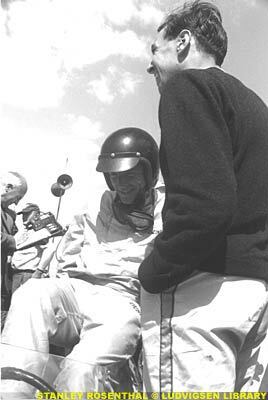 For Gurney, 1961 was a memorable year where he demonstrated that he deserved to be regarded as one of the top Grand Prix drivers. He had switched from BRM to drive for Porsche and, as an example of his prowess, at Rheims he distinguished himself against the favored Ferrari, slipstreaming Giancarlo Baghetti, who, after several retirements of his more illustrious teammates, was the lone survivor of the four Ferraris that started the race. Neither Baghetti nor Gurney had ever won a Championship Grand Prix and yet, because of retirements, the race came down to them. Gurney tried everything he knew to pass the Ferrari with his Porsche and make it stick, but the young Italian kept taking the lead back at the start-finish line. The red paint on the twin nostrils of the sharknose Ferrari No. 50 was pitted with the pebbles being thrown about during the furious slipstreaming battle. Finally on the last lap, Gurney was in the lead as the two cars came out of the last corner and on to the main straight at Rheims, but Baghetti again pulled out of Gurney's slipstream at the last moment and with that last impetus the Ferrari got by the Porsche at the start/finish line, winning by one tenth of a second. For Baghetti it was his first World Championship Grand Prix and his only win and remains the only time a driver has won his first World Championship race; for Gurney, it was another near-miss that Gurney could do nothing about unless he had been willing to simply block Baghetti, NASCAR-style, which he was not prepare to do. 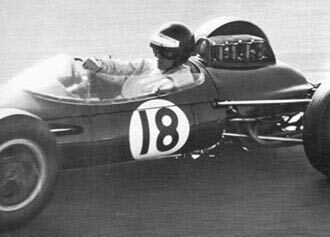 If 1961 was Gurney's best year (tying with Moss for third in the Drivers' Championship), Clark's 1961 was a very different kettle of fish, tinged by tragedy on a personal level, and consigned to driving a car that was not yet up to par with the Ferrari. Nonetheless, Clark did have some stirring drives in 1961. At Zandvoort, Clark was the meat in the Ferrari sandwich, setting fastest lap and finishing third - the only car that could keep the Ferraris of Phil Hill and von Trips in sight. And at Nurburgring, in a wet/dry race that ended in the rain, Stirling Moss managed to win and beat the Ferraris and Clark finished fourth, using the new V8 Climax engine. 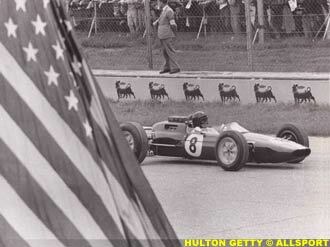 But it was at the Italian Grand Prix at Monza that Clark's 1961 season turned permanently sour, when he was involved in a chilling accident between his Lotus and the Ferrari of Wolfgang von Trips. In the second lap of the race, Clark, who had been keeping pace with the sharknose Ferraris surrounding him, came up on von Trips at about 140 mph just before braking for Parabolica, and was about to pass von Trips under braking - the Lotus having had the benefit of the slipstreaming the Ferrari - when Clark's front wheel suddenly touched the left rear wheel of the Ferrari, causing von Trips's car to spin out of control, hit the catch fencing on top of the earthen banking and somersault, throwing the driver out of the cockpit of the Ferrari and killing him. Fourteen spectators who were watching the race from the banking were also killed in this accident. Clark's Lotus also spun violently, onto the grass and over to the banking, finally coming to rest on the grass, leaving Clark badly shaken but unhurt. Some observers say that when it was all over, Clark, numbed by shock, attempted to drag the driverless Ferrari off the track, because the car had ended up in the path of the other cars after flinging von Trips out of the car. As with Senna's fatal accident at Imola in 1994, the Italian authorities were soon on the case, pursuing Jimmy, who had fortunately been flown out of Italy in his numbed state by the ever-alert Colin Chapman. The consensus explanation for the accident was that von Trips never knew Clark was right behind him and was therefore unaware when Clark moved out of the slipstream and tried to pass him. Accordingly, wheels touched when von Trips moved over to the left while Clark was simultaneously going for the pass. The tragic 1961 season ended quietly for Clark at the US Grand Prix in upstate New York at Watkins Glen, where his teammate Innes Ireland finished first, clinching the first World Championship Grand Prix win for Lotus, but Jimmy finished an indifferent 7th, just ahead of now-legendary Marlboro Team Penske owner Roger Penske, then 24 years old and participating in the first of his two US Grands Prix. 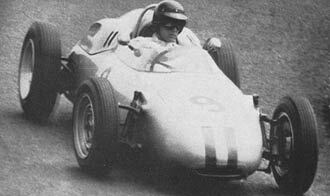 Gurney, on the other hand, had better luck and finished 2nd in his home Grand Prix for Porsche. In the end, 1961 was best forgotten for Clark, who finished 7th in the World Championship, the lowest standing for a full Grand Prix season during his entire career. 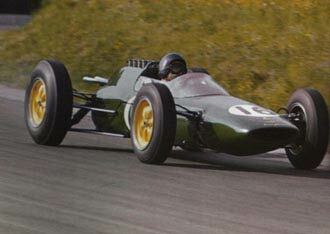 By 1962, the other teams had narrowed the gap with Ferrari; Lotus, Cooper and Lola who were now using the Coventry-Climax V8's, BRM introduced its own "stack pipe" V8, and the Porsche 804 had a new air-cooled flat-8 as well. Moss was out before the season began after his Easter Monday accident at Goodwood, but otherwise the stage was set for close racing and the Dutch Grand Prix at Zandvoort was representative. Clark and Gurney were in the lead early in the race but both experienced gearbox problems and Graham Hill's BRM Type P578 went through for his first win in what would turn out to be his first Championship Season. Monaco featured another Clark/Hill duel, with Clark (who had qualified on pole) breaking the track record as he closed on McLaren in his Cooper and on Hill's BRM, the early leaders. Ultimately, Clark's clutch gave him trouble and then the engine went sour and Clark was out at half-distance; Hill too showed the strains of their duel, with the BRM V8 running out of oil and seizing up with just laps to go. McLaren inherited the lead and won for Cooper. Clark's growing mastery of the Lotus 25 was on full display at Spa in 1962, where he qualified poorly in 12th but was in the lead by lap 9 and maintained it to the end, giving Clark his very first Grand Prix victory. But something else happened during that race that was revealing of the times and of Clark on a personal level. Clark's Lotus teammate, Trevor Taylor, was engaged in a ferocious and risky duel for second place with Willy Mairesse in the Ferrari, which ended with a spectacular accident at Blanchimont, leaving Mairesse's year-old sharknose Ferrari overturned and burning on the roadside and Taylor's Lotus 24 in pieces not far away, having struck and brought down a telephone pole. Miraculously, both drivers survived the accident, the smoke and the fire. Once back in the pits, a shell-shocked Taylor, his trademark bright yellow uniform spattered with oil, was brought out to the pit wall as Jimmy passed the pits to set Clark's mind at ease as to his teammate's condition. Clark was on pole for the next race, the French Grand Prix at Rouen, but his front suspension gave out, Hill's throttle linkage failed, Surtees had problems with his transmission and fuel feed, and Gurney's Porsche inherited the lead with 4 laps to go, leading to Gurney's first Grand Prix victory and Porsche's only World Championship victory. But the 1962 British Grand Prix at Aintree was what would become known as Vintage Jim Clark: he qualified on pole, set fastest lap and led throughout, lapping everyone but the top three finishers. At a rain-soaked Nurburgring, the conditions were so terrible that the drivers were allowed to take one parade lap of the 14.17 mile circuit so that they could see where the puddles lay. Then the organizers delayed the start for an hour. While waiting for the proceedings to get going, Clark had switched off the fuel pumps to prevent fouling the spark plugs. Then Clark's goggles misted up, the flag fell, he forgot to switch on the fuel pumps, and as a result he botched the start completely and started last, 13 seconds behind the field. Once underway, Clark was flying, passing 17 cars on Lap 1 of the race, which in those days took about 10 minutes! After three laps, he was in eighth place and by lap 8 of the 15-lap race, he was in fourth place, only 14 seconds behind Hill, Surtees and Gurney. But by then, Clark had scared himself silly and settled into accepting fourth place as the best he could safely do that day. And, in a year that was rapidly turning into a Clark/Hill struggle, Hill won one of his most impressive victories in the BRM P578 and Gurney in the flat-8 air-cooled Porsche 804 also turned in a stunning drive for the German crowd. Gurney led for two laps but then fell back because his battery had broken loose from its moorings and was rattling around beneath his knees and he had to secure it. Nonetheless, the top three were nose-to-tail all day long around the treacherous circuit. When Jimmy went out of the Italian Grand Prix on lap 3 with gearbox failure after leading, Graham Hill claimed another first place, with his BRM teammate Richie Ginther second, and the Championship struggle between BRM and Lotus tightened with only two races left. Interestingly, the Porsche team had fitted special disc-like wheel covers for this race to improve the aerodynamics of the car in the slipstreaming affairs that always characterized Monza. Gurney finished out of the points but his teammate Jo Bonnier managed sixth place. With everything on the line, Clark pulled out all the stops to finish first ahead of Hill at the US Grand Prix, driving half of the 100-lap race without a clutch! But the World Championship was not settled until the final round, the South African Grand Prix at East London. Clark was on pole with Hill beside him on the front row. Clark took the lead and built it to 30 seconds. But on the 63rd of 82 laps, the proverbial fifty-cent oil pan plug bolt worked loose, causing all the engine oil to drain out, forcing Clark out and handing victory and both World Championships to Hill and BRM respectively. 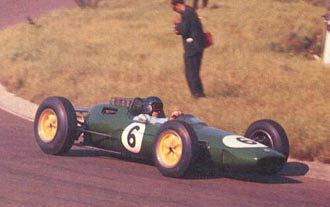 By 1963, Jim Clark had paid his dues, proved his worth and was poised to have a spectacular year. And, both in Grand Prix circles and in the Indianapolis cars, Clark and Lotus came though on all fronts. Clark won seven of the ten Championship races (a higher percentage than even Ayrton Senna's dominant 1988 season with McLaren-Honda), scoring 54 points to Hill's 29 points. In America, Clark was similarly successful. On May 30th 1963, he ran and almost won his first Indy 500 in his rear-engined Lotus-Ford, finishing second in a controversial race won by Parnelli Jones in his trusty front-engined roadster named "Old Calhoun" that probably should have been black-flagged for dropping oil on the track. Two months later, Clark returned to the Indy cars and the oval tracks to run the Milwaukee 200, where he lapped everyone but Indy 500 winner A.J. Foyt, who ultimately won the Indy 500 four times. Clark seemed to have a healthy respect for A.J. Foyt throughout their oval track encounters and may well have held back in lapping him that day in Milwaukee out of deference to the outspoken Texan who was so popular with the American Indy 500 fans. During this busy year for Clark, Gurney was Clark's regular companion wherever he went, finishing seventh at the Indy 500 as Clark's teammate in the second Lotus-Ford, and third in the Milwaukee 200 - all the while racing against one another for competing Grand Prix teams in Europe every other weekend. In retrospect, 1963 was a year when there was considerable cross-pollination between Grand Prix racing and the Indianapolis cars. In addition to Clark and Gurney racing the Lotus-Fords, then-World Champion Graham Hill also put an appearance in at Indy, taking his rookie test in early May and practicing in one of Mickey Thompson's rear-engined Harvey Aluminum Specials. But Hill hit the wall in Indy Turn 3 during practice and although Hill was unhurt, the car was heavily damaged. Hill then left for Europe to practice for the first race in the Formula One season, the Monaco Grand Prix, which he ended up winning. Hill did return to Indy in late May but did not attempt to qualify. It is interesting to note that a time when there was no supersonic Concorde airplane available, drivers like Clark, Gurney and Hill were crisscrossing the globe in the Summer of 1963 at a prodigious pace. As an example, the Monaco Grand Prix was on Sunday, May 26th 1963 (Clark led but Hill won; Gurney did not finish); the Indy 500 was run, unusually, on Thursday, May 30th 1963; and in between Indy and Spa, on June 9th 1963, Gurney and Clark both drove in a sports car race at Mosport in Canada, on Saturday, June 1st 1963, and Clark competed in another sports car race on Monday, June 3rd 1963 at Crystal Palace in the UK! Previously: Part I Next Week: 1964. 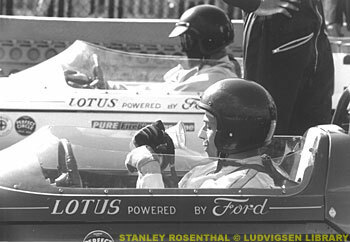 In the writing of this series of articles, the author relied upon several sources devoted to Lotus and Jim Clark, including "Jim Clark, The Legend Lives On" by Graham Gauld, a fellow Scot, a friend and a motor racing journalist who followed Jim's entire career and helped write Clark's biography, and "Team Lotus: The Indianapolis Years" by Andrew Ferguson, who was the Team Lotus Business Manager and a chief aide to Colin Chapman during the most tempestuous times at Lotus. Tim Considine's "American Grand Prix Racing" was also relied on for research on both Dan Gurney and Jimmy Clark and on the periods in which they drove. Karl Ludvigsen's recently published book, "Dan Gurney: All American Racer", is the one volume that finally does Dan justice.